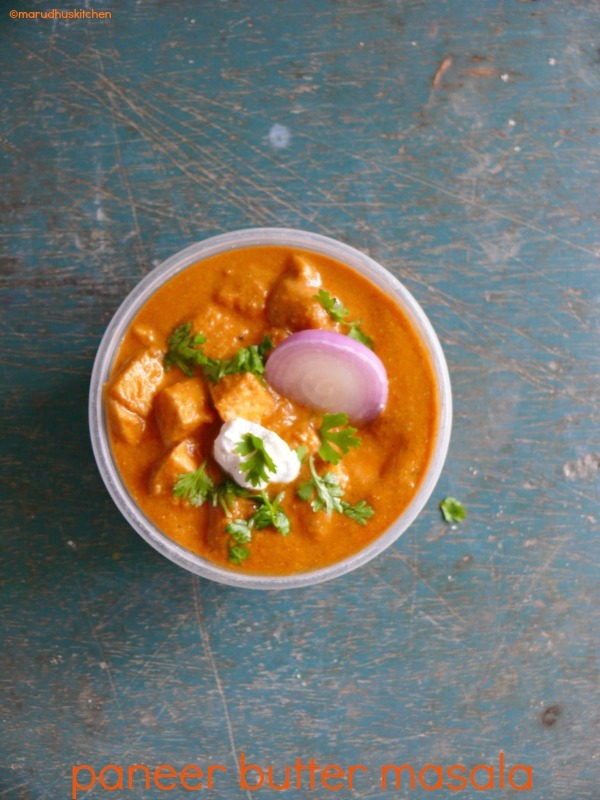 Most of our kids even us have a special fondness for this world renowned luscious gravy “The paneer butter masala”. Most celebrated restaurant item I must say!When we go to any multi-cuisine restaurant the menu lists may be with limitless varieties.But,we just end up ordering this creamy buttery paneer butter masala most of the time.My kids always love to order butter nan and for that the perfect pair will be always this paneer butter masala each time. It goes well with Nan,parotta,chappathi or even with simple phulkas.The method to prepare paneer butter masala is actually easy and of-course we can manipulate the method according to our own need.Adding cashews,butter and cream gives captivating creaminess to this dish.But for the exact rich restaurant taste these items becomes mandatory.Sometimes I do grind onions and tomatoes separately and do this masala but this time I have chopped sauteed and then did the grinding part.For grinding part itself I have added salt but while doing gravy always check for salt if it is balanced.After adding paneer don’t boil too much as it will become hard or rubbery. 2.After a second add onions and let it brown. 3.When lightly brown add tomatoes with some salt. 4.When tomatoes are soft add ginger garlic paste. 5.When rawness of ginger garlic is over add all the masalas. 6.Namely coriander,chilli and curry powders. 7.Now go on stirring till all the rawness of spices goes off and it should be nicely cooked. 8.Cool and grind it with cashews and keep ready. 1.In the same kadai add butter and add cloves,cinnamon,bay-leaves and small cardamom. 2.Then add the ground masala and saute well. 3.Add sugar to it and let it boil adjust some salt if needed and add water also to adjust consistency. 4.After 5 minutes of boil add kasuri methi and let it boil for some more minutes. 5.Now add paneer cubes and let it boil for 1 minute. 6.Switch off and add freshcream and coriander leaves and serve with nan,phulkas and chappathi’s. After a second add onions and let it brown. When lightly brown add tomatoes with some salt. When tomatoes are soft add ginger garlic paste. When rawness of ginger garlic is over add all the masalas. Namely coriander,chilli and curry powders. Now go on stirring till all the rawness of spices goes off and it should be nicely cooked. Cool and grind it with cashews and keep ready. In the same kadai add butter and add cloves,cinnamon,bayleaves and small cardamom. Then add the ground masala and saute well. Add sugar to it and let it boil adjust some salt if needed(add water to adjut consistency). Now add paneer cubes and let it boil for 1 minute. Switch off and add freshcream and coriander leaves and serve with nan.phulkas and chappathi's. I have added salt while grinding and adjusted it afterwards while doing gravy. I have used kashmiri chilli powder. You can adjust the gravy consistency depending upon your need. Crush methi leaves and add for more flavour. After adding paneer don't boil for too long as paneer will become rubbery. Perfect weekend indulgence Vani. I think I will never be able to have enough of that delectable bowl. Can I self invite myself to your home? 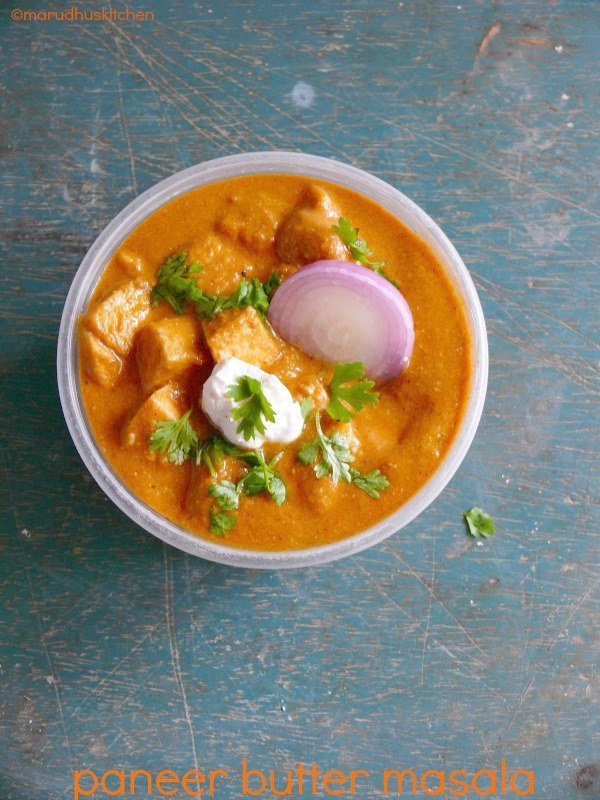 Paneer Butter Masala looks so delicious, my favorite.